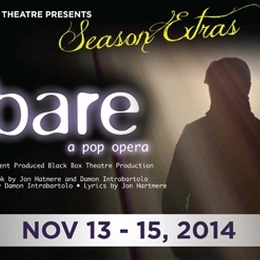 Sinclair Theatre will hold OPEN AUDITIONS for a student-produced presentation of bare: a pop opera on Fri., Sept. 5, 2014, beginning at 5:30 p.m. in the Black Box Theatre, Building 2, Room 411 on the downtown Dayton campus. Bare, by Jon Hartmere and Damon Intrabartolo, is a rock musical about high school students and their struggles with sexual identity at their Catholic boarding school. Prepare 16 bars of a musical theatre song and a 1-minute dramatic monologue. An accompanist will be provided so bring sheet music: NO A cappella or CD recordings. Actors should bring a headshot and resume. Callbacks will be Sat., Sept. 6th at 6 p.m.
Director is Chris Harmon. Rehearsals will begin September 29 with performances in Sinclair's Black Box Theatre November 13-15. Tickets $15 each.